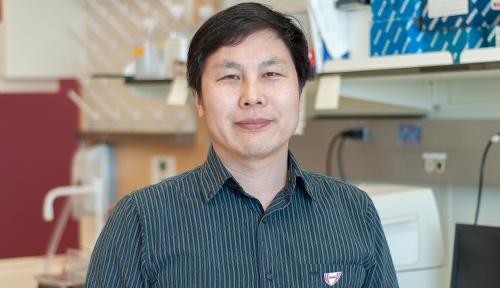 Meet UNMC New Investigator Cheng Wang, Ph.D. The ovary provides not only eggs for reproduction but also female hormones for normal physiological action. Under certain circumstances, pathological processes also take place in the mammalian ovary, causing infertility, sub-fertility or diseases such as ovarian cancer. Research in my laboratory focuses on the identification of the intra-ovary signals and molecules that contribute to the physiological and pathological changes in the ovary, so that novel diagnostic or therapeutic methods can be developed to improve women's health. Ovarian dysfunction causes most infertility in women. Ovarian cancer is the most lethal gynecological cancer in women. Research in our laboratory puts a new insight into our understanding of the regulation of ovarian physiology and pathology. Studies in my laboratory may discover new biomarkers for early diagnosis of ovarian cancer and may develop new drugs for improving the treatment of ovarian cancer. "I believe that you will be successful in the future because you are a responsible young man." This is the comment from Dr. Kazuyoshi K. Taya, one of my Ph.D. supervisors. I didn't know if I was really a responsible young man then, but I do know that his comment has been encouraging me to be a responsible man from then on. I was born in a quiet but beautiful small village in northwest China. I am a dad to two energetic boys. I like watching movies and documentaries with my family in my spare time.